Barring a last-minute breakthrough, taxes will go up for every U.S. taxpayer on Jan. 1 — and that’s a development conservatives should welcome. Don’t get me wrong: It would be better not to raise taxes on anyone, pursue pro-growth tax reform and cut the size of government instead. But that’s not what the American people voted to do last month. Americans cast their ballots for big government. Now it’s time to pay for it. Until now, the growth of government under President Obama has not hit the pocketbooks of most Americans. During Obama’s first term, federal spending grew to more than 24 percent of GDP — the highest it has been since 1946. Yet almost no one in the country (except smokers and those who frequent indoor tanning salons) saw their taxes rise. Quite the opposite: 160 million Americans saw their payroll taxes reduced from 6.2 to 4.2 percent. This is another example of Republicans thinking that the people are a bunch of idiots. If anyone could pick one thing they knew that Obama stood for it was raising taxes on the rich. It was one of the clearest points he made during the election. Interesting enough that graph was published to show that the tax cuts didn’t add that much to the deficit (using a false premise), but it also shows something more important, Bush was the spend happy President. Look even closer and you see that it wasn’t just Bush, but also the Republican Party. The highest points in that chart the GOP controlled both Congress and the White House. Now let’s remember what happened back in those days. For the first time in history this country went to war while getting a tax break. Actually we went into two wars. Republicans swore up and down that we could handle it, but now we know the truth. But war wasn’t the only thing increasing government costs. We also had this new, mammoth agency called Homeland Security born, becoming one of the biggest agency in the U.S. government. They went out and made things like the TSA and started the purchasing of full body scanners. These are all things that the Republicans want to pretend Obama did, but Obama was just a Senator at their inception. Republicans are the biggest spenders around – PERIOD! 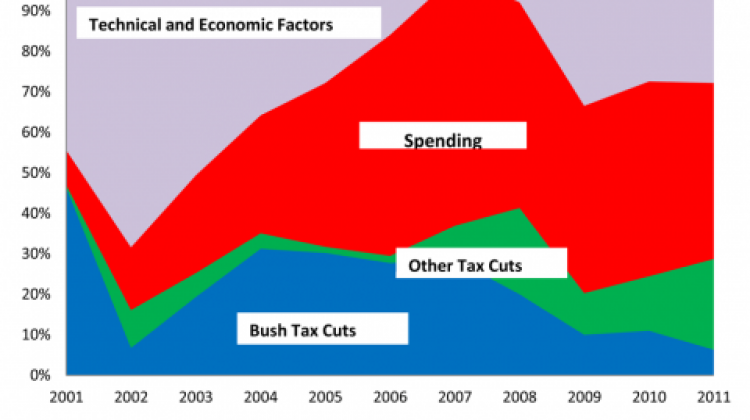 Now like I said a big ago, that graph was to prove that the Bush Tax Cuts don’t add that much to the deficit. But let’s look at another chart using data from the same CBO report. This one starts considering future indicators in our spending and revenue. Now you see that the Bush tax cuts do in fact start making a huge contribution to the deficit. These type of lies are the reason we are where we are today with the fiscal cliff. Republicans want to continue to push their highly failed ideology, instead of embracing facts. That’s why we will go over the cliff on Tuesday and why the people will blame the Republican Party. They once again are putting party ahead of nation.